To much applause yesterday, subscribers to the video game magazine Famitsu were revealed an up-and-coming Spring 2013 3DS title, Cardfight!! Vanguard Ride to Victory. The game is being developed by FuRyu, previously known for the Tsukumonogatari PSP visual novel-RPG hybrid and the 3DS/PSP dungeon crawler Unchained Blades, and will be retailing for 5229 yen, about 66.82 USD. While information is scarce at this time and the game is allegedly only at 40% completion, it is currently known that it will recreate the experience of playing the tabletop game, but on a handheld console. If and how this will take advantage of the 3DS' glasses-free 3D is unknown at this time, but the announcement is drumming much excitement from fans. As Cardfight's publisher, Bushiroad Inc., has had its hands in the video game market since before they turned their eyes to producing the CFV franchise, many have been waiting for this announcement since the anime debuted in January of last year. While there are many questions in the air as to how the title will be executed, already we do have some answers. The game is to feature its own original storyline, but still based on the anime series, with the protagonist seeking to challenge Japan's fictitious pro scene and fight for the national title. 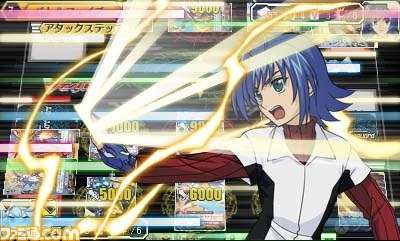 Aichi, Ren, Kai, Shin, Misaki and Kamui have all been confirmed through screenshots or scans to be making appearances, but their exact role at this time is uncertain. Players will be able to use points earned in the game's story mode and free play to buy cards from the in-game Card Capital to modify their decks. 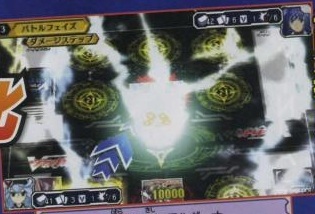 The current phase "battle phase" and inside of it "attack step" is listed in katakana at the top left; current number of cards remaining in deck, number of cards in the hand, cards in soul, and available counterblast are at the top right alongside a fighter's portrait. This setup is mirrored for the bottom left. Note that despite the season 1-inspired plot, Aichi is wearing his Circuit-era outfit. This pattern is likewise true for the remaining cast. Assuming that this screenshot comes from the 3DS' top screen, the hand seems to be shown on the bottom. Other confirmed details are that the in-game shop will sell booster packs directly patterned off of their real-world equivalents. Noticeably, none of the screenshots or magazine reveals so far have shown any cards from after TD07; due to the game being less than halfway complete, it may be speculated that cards from BT07-08 will be included in the final product, depending on its date of release. Additionally, magazine scans appear to reveal a new, original character not present in the existing continuities. This character may be a protagonist to embody the player in the game, if Aichi himself is not the protagonist. While these initial shots look promising, there are many predecessors in the genre already pinning the fledgling game's shadow. As early as 1997 MicroProse's Magic: the Gathering had recreated the earliest TCG in computer form, boasting free character customization, accurate recreation of gameplay and an expansive overworld to explore. Hudson Soft's 1998 Pokémon: Trading Card Game featured similar depth of innovation by converting the experience into a portable game accessible to a broader age range, taking advantage of the programmed environment to include cards that did not exist in the real world. In 1999 Konami completed this early triumvirate of VTCGs with the last entry of the "Big 3," Yu-Gi-Oh! Forbidden Memories, a PlayStation release frequently criticized for its inaccurate gameplay but lauded for its detailed graphical presentation--more akin to a visual novel than a VTCG as was established then--and for taking its own direction with an at-the-time incomplete storyline. Ride to Victory appears to follow a middle ground between the Memories and Pokémon patterns that were previously used in the Tag Force games, not sewing its plot from wholecloth but instead providing a different adaptation of a past storyline. Aside from these early forerunners, Japan's domestic VTCG market is already flooded by purely virtual innovations based out of arcades that deal real trading cards for use with scan machines (Monster Battle Road, Mushiking et al. ), and nearly as many handheld Yu-Gi-Oh! releases as Street Fighter II remakes. Despite the small amount of information presently available, there are already many expectations riding on Ride to Victory, and challenges that it must overcome in the highly competitive environments both domestically and abroad. Given how Bushiroad has handled similar challenges facing both its real TCG and the anime, the future is nonetheless looking bright for Victory. In other news, a second Big Vanguard Fest event was announced for 2013. This event will take place on from 27 April to 28 April, in the same two-day style as the 2012 Fest.